This is the northernmost Pacific coastal rain forest remaining intact in Costa Rica, and is the transition zone into the tropical dry forests of the northwest. 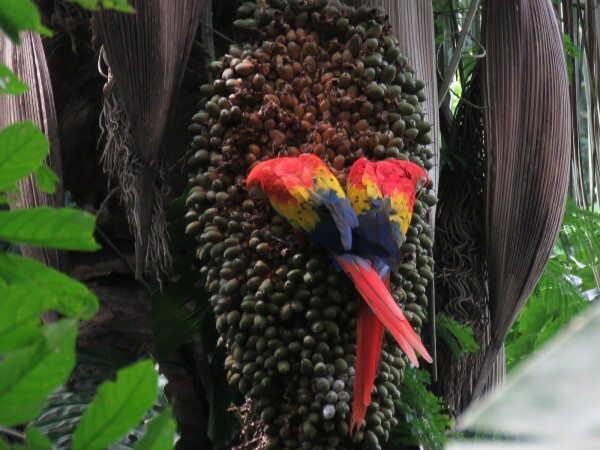 Carara is one of Costa Rica’s most popular National Parks, in large part due to its proximity to San José. This is also where many cruise ship’s passengers are bused for a day trip when the liners dock just up the coast at Puerto Caldera, and a common destination for field trips by school children. One advantage of the relatively large numbers of people that visit Carara is that if you just stop by, you are likely have several quite competent amateur guides at your disposal. Birders are a friendly lot, and they generally like interest from novices (as long as you don’t interfere with their spotting. Walk quietly and slowly). We made a spontaneous stop here, and found that one of the best ways to see wildlife was to look for people with their necks craned, peering into the brush or canopy. We would then stop at a respectful distance, and look where they were looking. More often than not the guide, or one of the birders would invite us over to look through their binoculars or spotting scope while they described the habits of the bird or animal we were seeing. 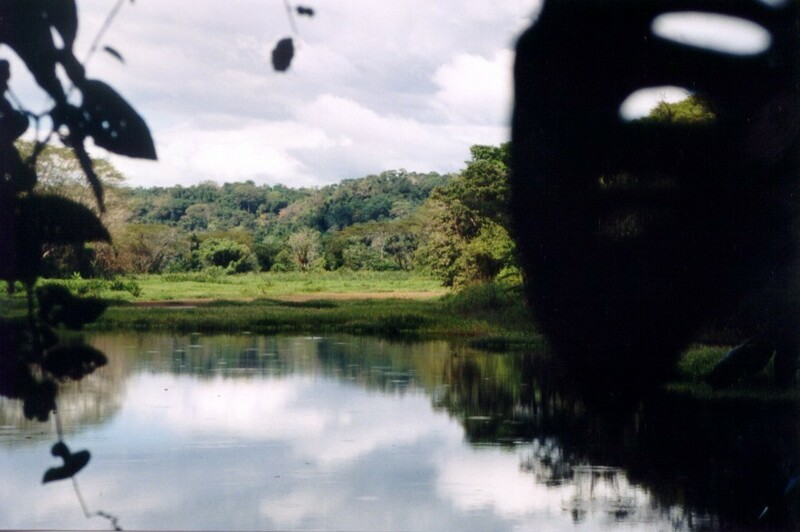 Most people don’t even realize they are in a National Park at the “Crocodile Bridge” but the Tarcoles river is the northern boundary of the park. Despite the souvenir stands, t-shirt hawkers and police cars prominently displayed to deter thieves from removing everything from the tourists cars while they peer over the railings at the monsters fifty feet below it’s a National Park. In 2014 there was a crack down on tour guides who were putting on shows by illegally hand feeding frozen chickens to the 20 foot crocs but the big reptiles still hang out sunning themselves on the banks of the river and strangely enough most of them still have bellies full of chicken too. Carara is a favorite with bird watchers for several reasons besides its ease of access. First, its position in a transition zone means that residents of both habitats are likely to appear. Second, the Río Grande de Tárcoles has free flowing sections and its waters seep into seasonal marshlands and a shallow oxbow lake covered with hyacinths further expanding the number of distinct local habitats to nearly a dozen. Finally, because it is slightly dryer and not all of the trees are evergreen, Carara is more open than the rainforests further south making wildlife spotting easier. 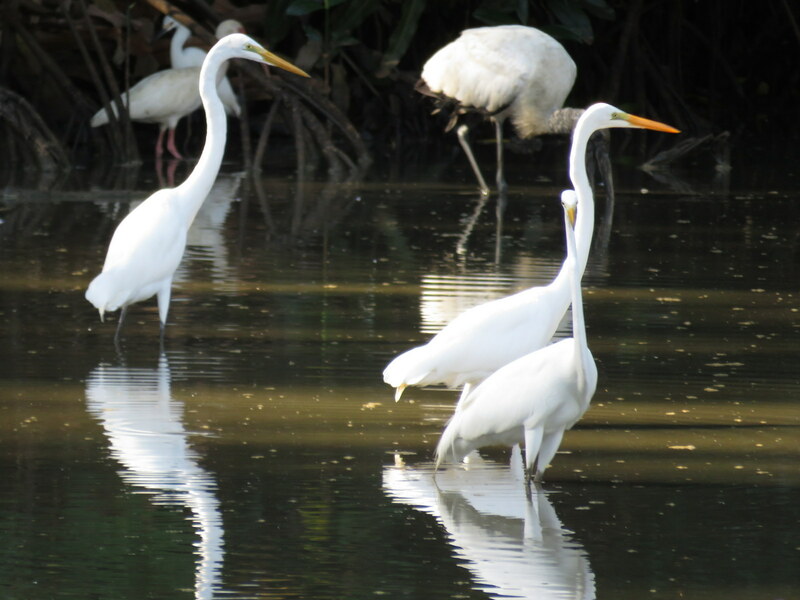 You can see from our Carara national park photo album how easy it is to get amazing shots since we’re no professional photographers and certainly don’t lug around huge telephoto lenses. A few of the local animals include Opossum, Two-toed Sloth, Agouti, Armadillo, Pacas, Great Anteater, Kinkajou, Tayra, Margay cat, Collared Peccary, White-tailed Deer, Poison-arrow Frogs, and the omnipresent monkeys. Birds- Collared Aracari, Fiery-billed Aracari, American Egret, Great Tinamou, Turkey vulture, Long-billed Gnatwren, Chestnut-backed Antbird, Black-hooded Antshrike, Keel-billed Toucans, Anhinga, Jacanas, Pied-billed Grebes, Mexican Tiger-bitterns and Boat-billed Herons. 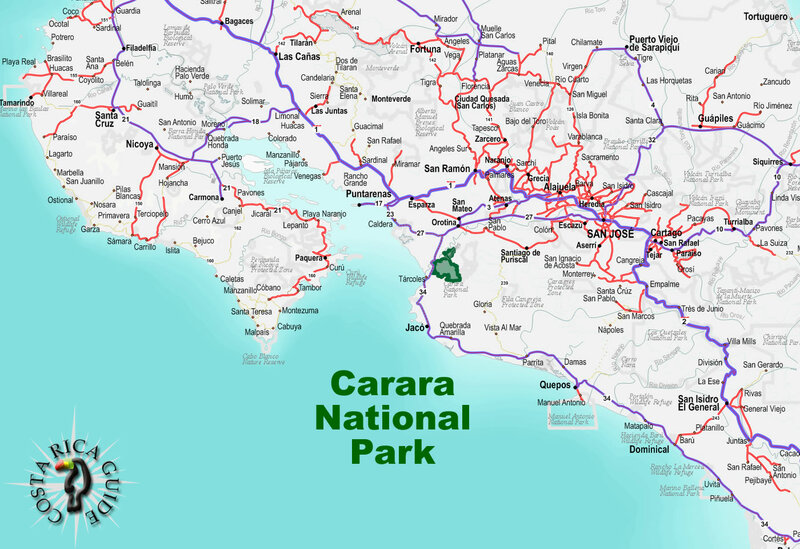 Carara is a great place to stop off for a quick hike on a trip up or down the pacific coast any time of the year. If you are headed to or from slothful beach bumming, take a few hours to explore a trail. The rewards will be well worth the effort, and you will feel better after a little exercise. 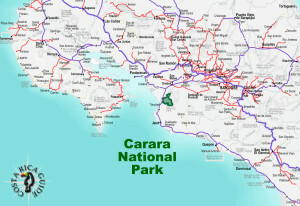 There are two hiking trails in Carara. Half a mile (1 km) south of the bridge on your left as you head towards the rangers station there is parking for a 2.7 mile (4.5 km) Laguna Meandrica trail that parallels the Río Grande de Tárcoles and has short branches to the laguna and marshes. This trail is closed in the heart of the rainy season (about late August to mid November) because it’s often covered by several feet of water when the river floods. The short (0.6 mile, 1 km) Araceas Nature trail is a loop that starts and ends at the main Quebrada Bonita ranger station. Be cautious parking at the trail heads, and even the ranger station. The parking is just off the highway, and if you leave any valuables in your car (including the trunk), odds are pretty good that a opportunistic petty thief will grab them and be miles down the road before you return. Driving from San José or Juan Santamaría International Airport – Take the Caldera Highway (Hwy 27) west to the intersection with Hwy 34 8 km past Orotina. Follow 34 approximately 18 km south to the bridge over the Tárcoles River and the park boundary. The Quebrada Bonita ranger station, visitors center & park headquarters is 3 km further south. Buses to Jacó or Quepos will drop you at the ranger station, but you better have a plan for getting to someplace to sleep before nightfall, camping is not allowed in the park and there are no accommodations. You can flag down the bus in either direction, but it’s less likely they’ll stop after dark. Plan ahead. It is always hot and humid in the forests of Carara. Even during the drier season from late December through April when there is significantly less rain, transpiration keeps the humidity under the canopy near saturation. The wettest months are August to October when the trails near the river may at times be impassable because of flooding. The protected area is 4700 hectares and elevations range from 100 to 500 meters (328 to 1640 feet). 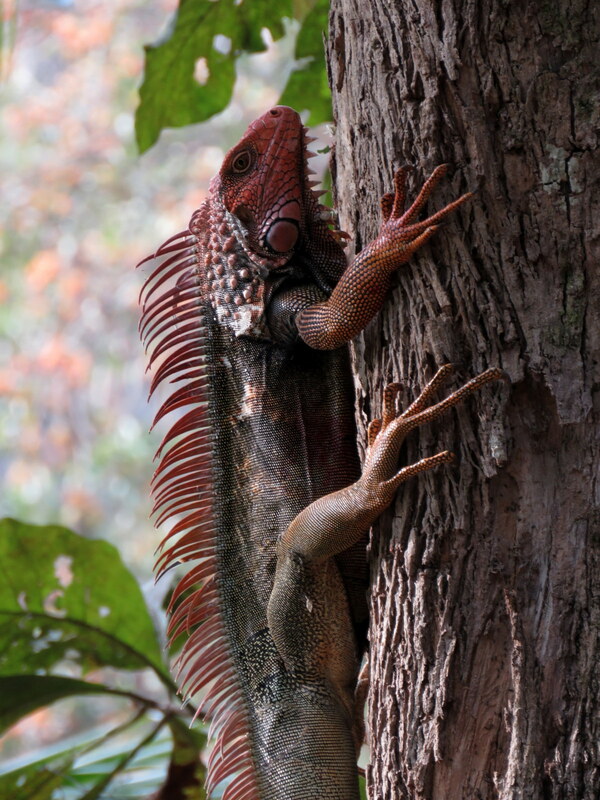 The habitats represented here are regenerating tropical rainforest-lowland and tropical dry forest. The land protected by Carara was donated to the parks service in 1979 by another branch of the government, the Instituto de Tierras y Colonización who’s primary function was to redistribute large ranches obtained by the government to family farmers. Except along the river, the area was mostly old growth forest when El Coyolar ranch became Carara Biological Reserve. 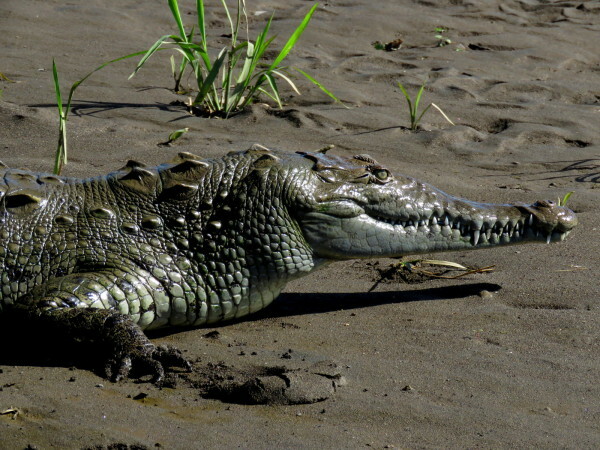 Carara takes its name from the Huetar Indian word for crocodile.